It’s Dom’s 15th birthday and his life will never be the same. A meeting with his father and grandfather leaves him reeling when he discovers that it is up to him to repay a debt that’s been haunting his family for generations. If he fails? He pays with a pound of flesh – his own. 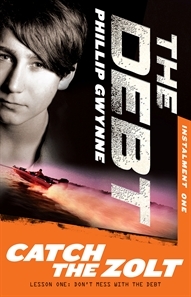 A secret and deadly organisation called The Debt, requires Dom to complete six formidable tasks. Catch the Zolt tells the story of Dom’s first assignment. Zolt, a 17-year-old Facebook hero is in the habit of stealing small planes. Although he has eluded capture many times, he is finally caught – but not for long. After the Zolt escapes, it’s Dom’s job to find him and hand him over to The Debt. The last place The Zolt was seen is Reverie Island where Dom’s self-centred and arrogant neighbour, Tristan has a family holiday home. Dom finagles an invitation accompanied by his beautiful best friend, Imogen, and the recent object of his affection. Unfortunately, Tristan is the recent object of Imogen’s affection. Although Dom’s focus is slightly blurred, he has a job to do. He’s determined to hang onto every pound of his flesh. Catch the Zolt is a novel packed with adventure, danger and the stirrings of new love. Readers aged 10-14 will be swept up in this fast-paced tale from the very first page. Dom is a likeable and believable character in an unbelievable situation. His reaction to his plight makes the story realistic and his courage and newly tapped skills allow readers to feel empowered as they follow Dom on his perilous mission. Phillip Gwynne uses language in such a way that he hands over his story like a gift. The writing flows smoothly as the story of Dom’s first daunting task unfolds. The best aspect of this book? There are five more to come. I would recommend Catch the Zolt to anyone with a taste for adventure.